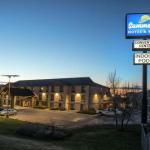 Featuring a casino an indoor pool free Wi-Fi and free breakfast Ramada Summerset/Rapid City West provides comfortable lodging about 10 minutes from Rapid City. The three-story Ramada's 55 rooms come with a coffeemaker cable TV free Wi-Fi and plush-top mattress. The indoor pool and hot tub are surrounded by light wood paneling on the high ceiling and walls. Stop by the casino and lounge for drinks and games of chance. For something to eat start the day with the complimentary breakfast or get a snack at the 24-hour convenience mart. Parking is free and non-smoking rooms are available. Pets allowed in smoking rooms for an extra fee. Less than a block from I-90 the Ramada is a block from a pizza restaurant and six miles from the Petrified Forest of the Black Hills. Drive eight miles to Fountain Springs Golf Club or 13 miles to the Sturgis Motorcycle Rally & Museum. Drive 33 miles to Mount Rushmore National Monument for a must-see tourist attraction. Denver International Airport is 406 mile away.